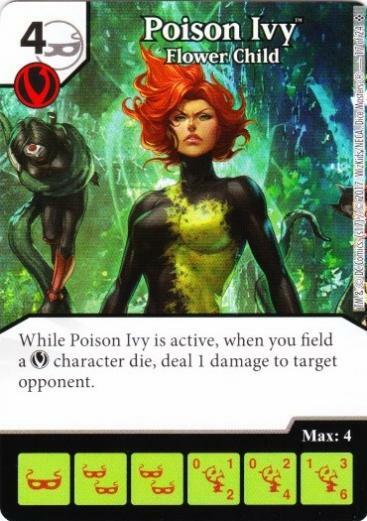 When I saw Poison Ivy – Flower Child from the Harley Quinn team pack I wanted to try pairing it with uncommon Malekith and SR Jubilee. If I have all three of them out, that’s 2 points of burn damage for every Sidekick I field. With a team already focused on fielding Sidekicks, I opted to include the Rare Professor X from XFC so I had the Modern PXG global, and include Mimic for ramp. Jane Foster is an Ally who has a 0 fielding cost on all levels, giving me more Sidekicks to field. Nova Corps Uniform was added primarily to give me a means to protect Mimic from being pinged out. 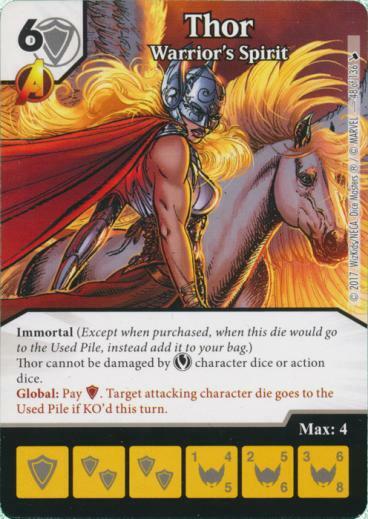 The eighth slot went to Thor – Warrior’s Spirit for her global. I thought I’d see if sending annoyingly persistent attackers to the Used Pile without actually taking damage might prove useful. BACs were Big Entrance and Villainous Pact. The first because I had several 2-costs, the second both for the Prep global and as a backup plan. 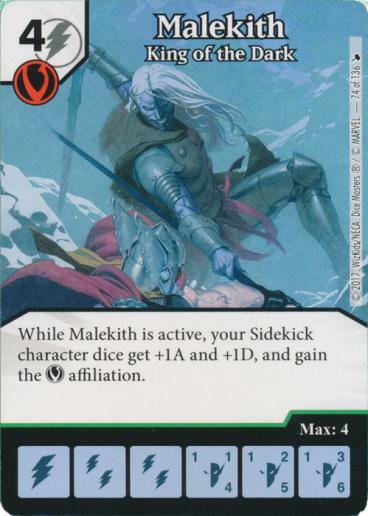 If I have Malekith out, I don’t need to worry about the action being used against me, and I can use it offensively myself unless my opponent is running a Villain team. 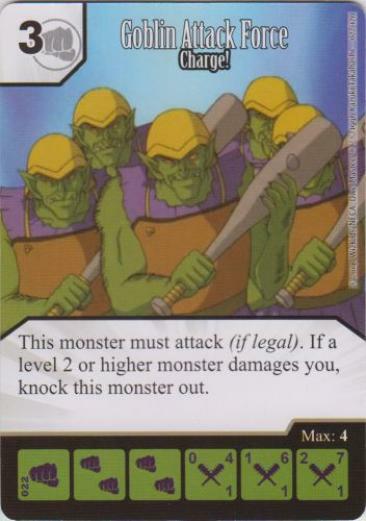 This team was all about the common Goblin Attack Force from Yu-Gi-Oh! His plan was to buff a Goblin die like crazy with Improvised Weapon basic action dice and buff globals, and give it overcrush with an Anger Issues basic action die. His problem was Goblin Attack Force has 1D on all levels. 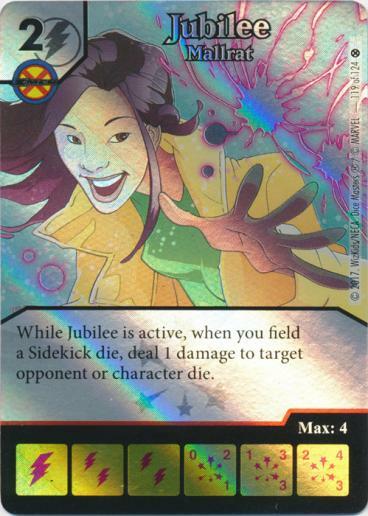 Once I had Jubilee out (which I was able to do quickly) it was fairly easy to save a mask and use the (Modern) Professor X Global to field a Sidekick and ping off Goblin Attack Force when Jubilee’s ability triggered. If I was also able to save a shield I could send Goblin Attack Force to the Used Pile with the Thor global. That allowed me to keep his field thin while building up my own (and inflicting some burn damage in the process.) Eventually I outnumbered him to get lethal. This was mostly an Avengers team, although he also had the R Bishop which would have slowed me down if he’d been able to roll it on a character face. But he struggled to roll Bishop or any other character faces, except for an Attune Wasp. That allowed me to do enough burn damage to allow me to finish him off with a mass rush. The new Batman that gives your attacking Sidekicks +2A, the UXM Falcon that makes your Sidekicks unblockable when he attacks, S.T.A.R. Labs and one of the Maximum Carnage Captain Americas with the Sidekick fielding global. Even if I was able to save a mask, I was only able to ping out a single Sidekick each turn, and he was able to send enough 3A unblockable Sidekicks to wear me down. The same Batman as Game 3, but this player was combining it with Deadshot – Death Doesn’t Scare Me and Poison Ivy – Red. Once I got Malekith out my Sidekicks got +1D, which meant they would still survive if Deadshot’s ability triggered. Poison Ivy’s A is low enough that letting her through a time or two is manageable. I got Malekith and Ivy out, but I wasn’t able to use PXG very much (either one – I was running Modern PXG, my opponent was running Golden) because I was really struggling to roll masks in this game. Part of that was I hadn’t managed to buy any mask characters except Ivy who I was keeping in the field, and I was also keeping a decent number of sidekick dice in my field, as I needed something to block his (buffed) Sidekicks. To compound this, I bought a Big Entrance on my first turn, and it never came up on an action face the entire game. There was point where he had only a single Batman die in his field, but I couldn’t get to lethal. 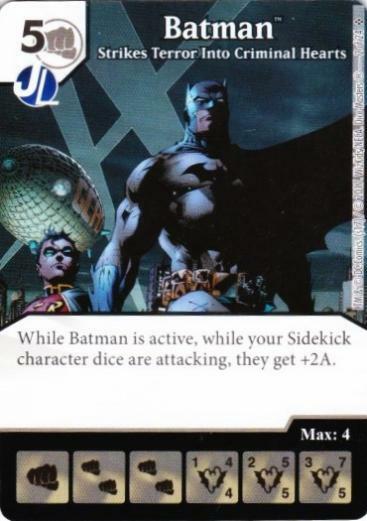 Between Sidekicks I’d pinged, characters I’d KOed while blocking from an attack on his previous turn and his use of Golden PXG, he’d be rolling something like 12-13 dice on his turn. Even though I had a Jubilee, a Malekith and a Poison Ivy out, along with 3 Sidekicks, I wasn’t terribly confident I could survive his next turn, seeing I was at 7 life. However he proved not quite able to finish me on his next turn, but the attempt left his field too weak to prevent me from finishing me off on my following turn. This was a decent team, neither great nor terrible. It’s a beast once Jubilee, Malekith and Posion Ivy are in the field together, but that’s a 3-character combo where 2 of them are 4-costs. In retrospect, including Mimic was probably a mistake. Since 2 of my opponents were using Golden PXG, I simply used that myself, which saved from using a ramp method that required me to buy another character. I hadn’t seen the Thor global get a lot of use before this event, but I found it very useful. One thing that came up a lot at this event, at least for me, was the rules on passing priority. On multiple occasions on the night, I used Jubilee’s ability to ping off an opposing Sidekick that had just been fielded via the Professor X global. In most cases, that meant my opponent had 1 less Sidekick to block with than they could have. It’s more or less customary for the active player, during his Main Step, to make all the purchases and field all the characters he intends to before passing priority to the opponent, but this is not required. Sometimes its more prudent to give your opponent the opportunity to use globals earlier, so you have more bullets in your gun to decide how you want to respond to his actions. Of course, that depends on your opponent taking the bait, so to speak. Which means when you are the opponent, and you’re passed priority at an unconventional time, you need to ask yourself why that is happening, If the active player gives you an opportunity, check if taking it helps you more than it helps him. Sometimes, it won’t make a meaningful difference. And sometimes the presence of a single Sidekick can mean the difference between victory and defeat.